One of the must-do’s in Seoul is none other than visiting one of the city’s ancient palaces -Gyeongbokgung Palace, Gyeonghuigung Palace, Deoksugung Palace, Changgyeonggung Palace and Changdeokgung Palace and Huwon. These architectural gems were not only residences of kings and queens, but were also the center of politics and city life during the Joseon Dynasty (1392-1910). Designated as a World Heritage site by UNESCO in 1997, Changdeokgung Palace is said to be the most traditional and authentic of Seoul's five palaces. It has been praised for its architectural sensitivity to its natural surroundings and lauded as a representative masterpiece of East Asian Palace Architecture. The palace is also believed to have the perfect geographical location according to ancient philosophies like that of Feng Shui. The palace is even more magical when seen under a full moon. 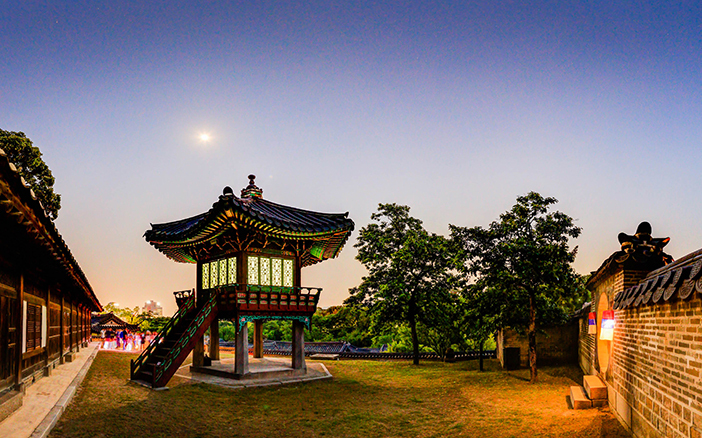 Join the Moonlight Tour at Changdeokgung Palace for a pleasant evening stroll within the royal palace. Tidbits to make your palace journey even more enjoyable! Donhwamun Gate is the oldest of all the palaces’ main gates. First built in 1412, it was burnt down during a period of conflict and later restored in 1608. The two-story high gate was given the name Donhwa, which means "to teach and love the subjects with compassion." This is where participants can take memento photographs with chief gatekeepers in traditional uniforms before the tour. The Moonlight Tour officially begins with cheongsachorong (a traditional candle lantern from the Joseon Dynasty covered with red and blue silk) lighting the path. The main building of the palace, Injeongjeon Hall was used as a reception venue for foreign diplomats as well as for royal ceremonies such as a coronation. Inside this prestigious room, visitors can see the king's throne and folding screen behind, called Ilwoloakdo byeongpung, embroidered with the sun, moon, and five mountain peaks. The hall itself is quite beautiful lit up at night, but be sure to take a moment to observe the full moon and the modern cityscape looming in the background. Nakseonjae was built as the study and sarangchae (living quarters of the head of a household) of King Heonjong (24th king of Joseon, 1827-1849). Literally meaning “to enjoy virtue,” Nakseonjae implies that a king should serve his people with virtue so that both the people and the king himself will be happy. After King Heonjong passed away, the compound was used by King Gojong (26th king of Joseon, 1852-1919) and King Sunjong (27th king of Joseon, 1874-1926) to carry out state affairs. 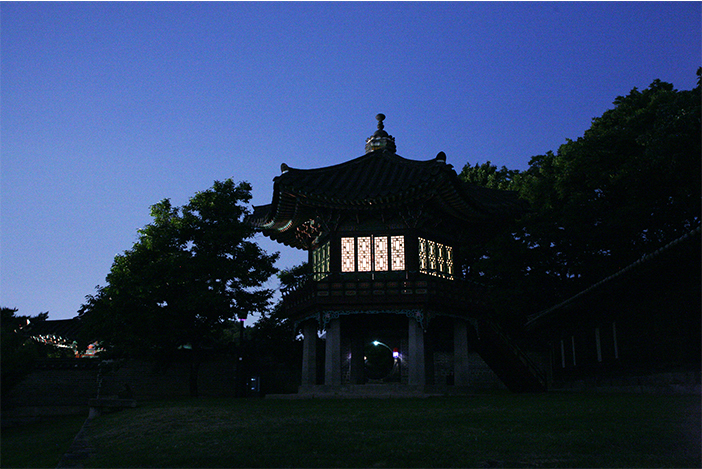 A hexagonal pavilion located on the hill overlooking Nakseonjae’s rear garden, Sangnyangjeong Pavilion provides a panoramic view of the surrounding area. 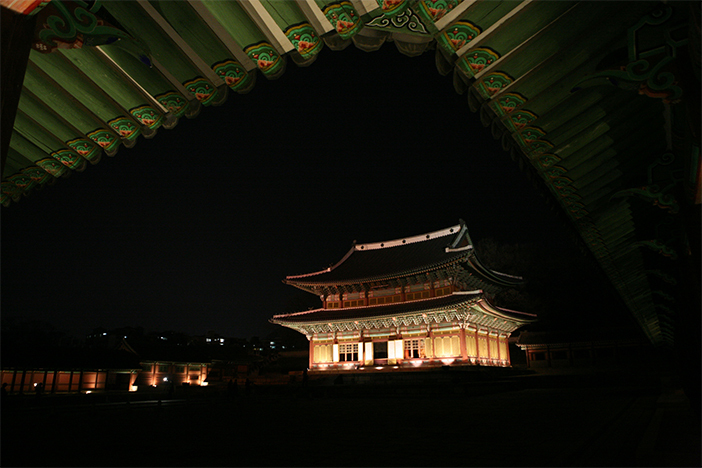 Participants of the tour will be able enjoy the mood of a moonlit night with a daegeum performance here. Buyongji Pond and its surroundings are the most beautiful and tranquil area inside Changdeokgung Palace and is one of the finest examples of landscapes designed during the Joseon period. This garden where kings would take leisure walks in the past consists of the small but pleasant Buyongji Pond and the surrounding trees that have endured hundreds of years, creating a cozy and elegant scenery. 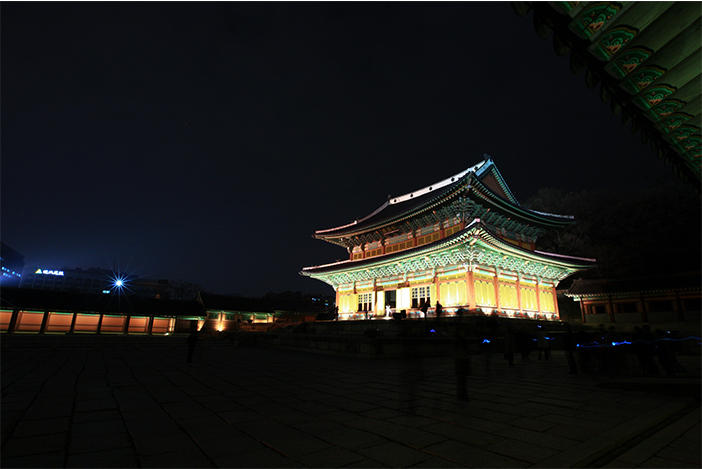 This area was the venue for celebratory banquets for those scholars who passed state exams during the Joseon Dynasty. Following one step behind the beauty of Buyongji Pond is Aeryeonji Pond. 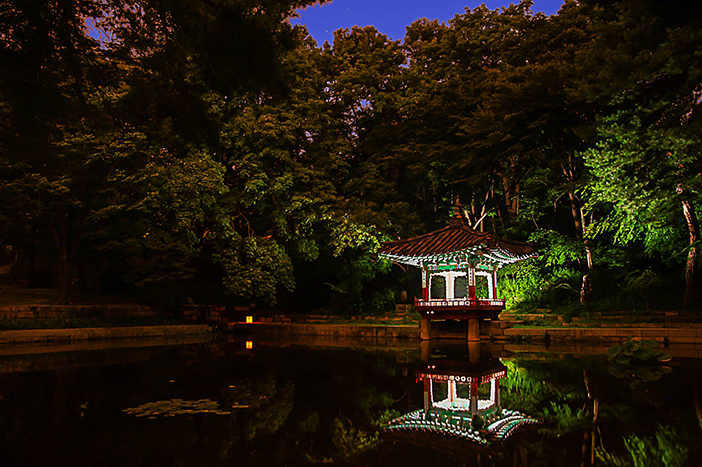 On the northern side of the pond is Aeryeongjeong Pavilion, a small pavilion placed half over the water, which is known to offer a gorgeous view of the pond’s scenery. Yeongyeongdang Hanok is a wooden building built in the same style as the houses of the noblemen during the Joseon Dynasty. The building was built in the 19th century and was used as a venue to hold ceremonies and performances for the royal family by the best performers at that time. 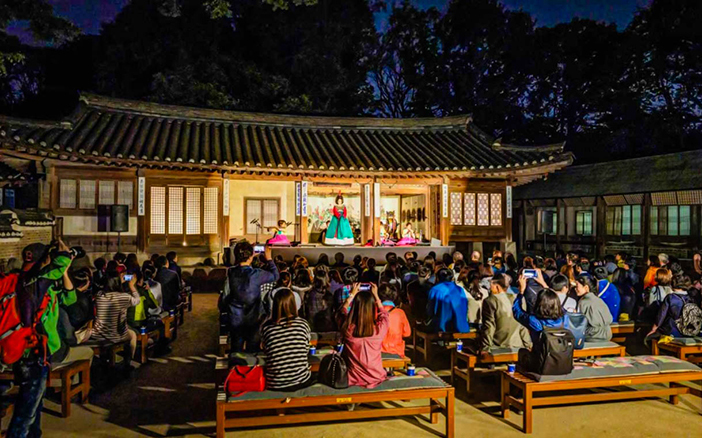 During your moonlit journey, Yeongyeongdang Hanok will serve as the venue for an array of gugak (traditional Korean music) performances. The building's expansive yard is complete with enough seats for the audience. Korean tea and snacks are served as well. 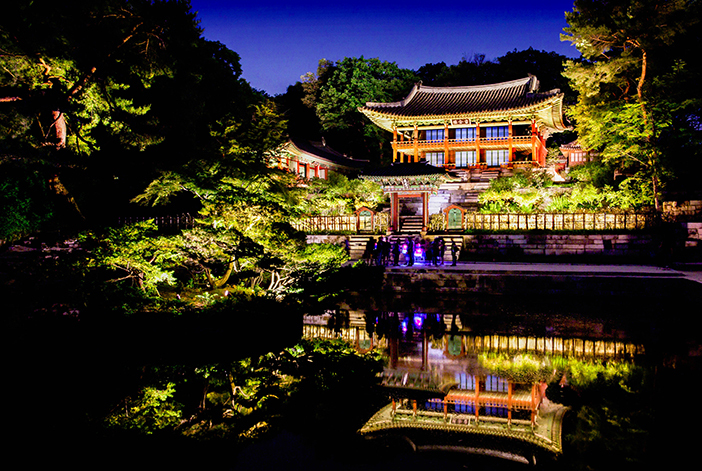 After the performance, visitors will be led into the forest of Changdeokgung Palace, known as Huwon. For centuries its access was strictly limited to the royal family. 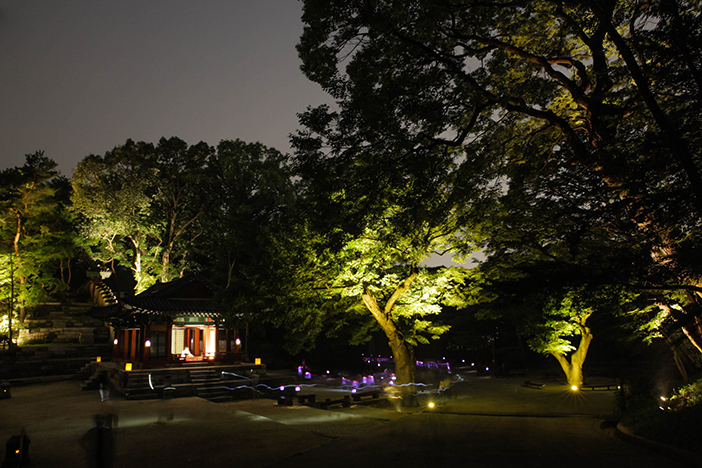 Now open to the public, guides dressed in hanbok lead visitors through the trees using the light of the cheongsachorong. Guided by the delicate glow of this traditional lantern and the serene light of the full moon, visitors are guaranteed a unique and unforgettable evening. 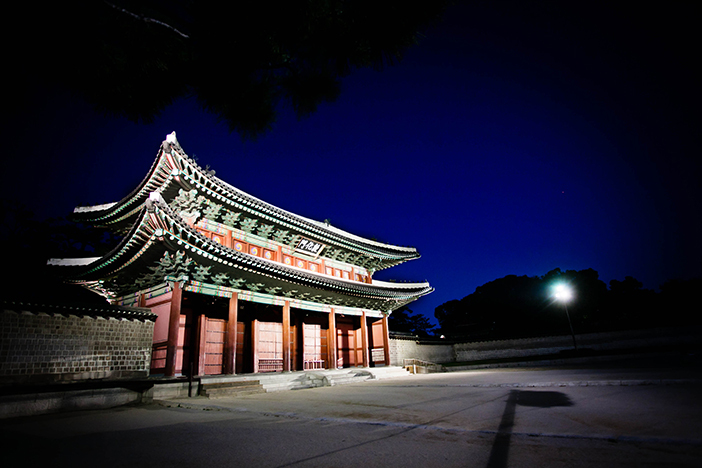 - Changdeokgung Palace Night Walk: Guided tour (Korean, English, Japanese, Chinese) through the palace, approx. 90min. ※ Tour canceled with full refund in the case of heavy rain (more than 5mm before 11:00 on the day of the tour).